The cows outside the Happy Cow Creamery of Pelzer, South Carolina, aren’t smiling, talking to each other in conspiratorial tones, or comically misspelling words in large billboard print. They aren’t doing much of anything, in fact, except snacking on grasses rich with alfalfa and clover under a grove of tall, shady trees. The air is balmy warm and smells of grass. Birds twitter from high branches. I can’t say if the cows are happy, know that they are happy, or are capable of feeling happiness, but “the girls,” as they are affectionately called, seem relaxed and content to graze on this sunny June afternoon. It took me a while, but I finally persuaded my mother-in-law to tour the farm and adjacent creamery with me. Our tour group met under the shaded picnic area, where we boarded a wooden wagon pulled by a green John Deere. As we gently jostled around the farm, three tour guides – Ashley, Suzanne, and Sonya – taught us about the farm’s history and the practices that have sustained its success, powering down the tractor at intervals to point out varieties in the grass and the beehives for honey production. 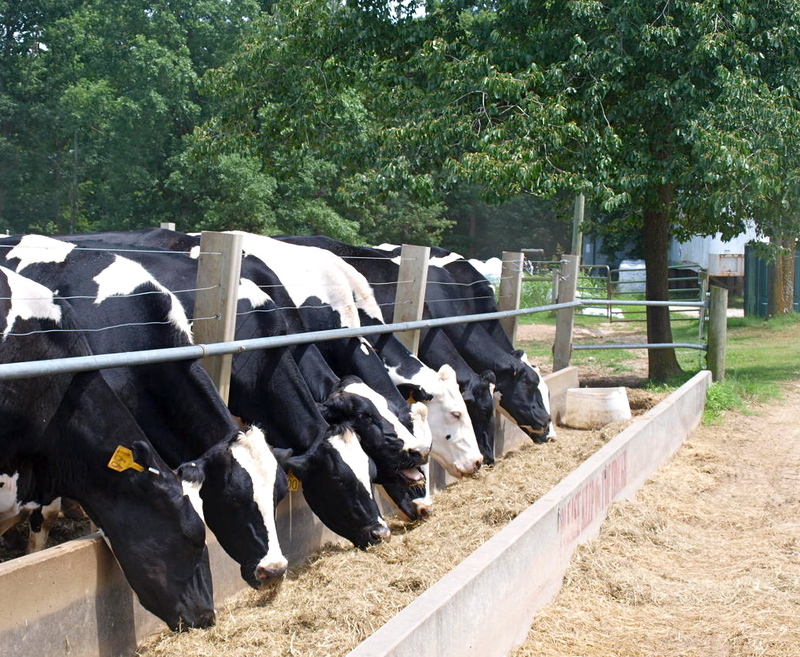 The farm prides itself on environmentally sound operation, and follows a method of herd rotation called 12 Aprils. The herd of approximately 90 cows rotates through the farm’s 29 paddocks. When the day is done and the herd has trimmed the grass of its nutritious uppermost tips, they are moved to another paddock to graze the following day. By the time they have rotated through all 29 paddocks, they return to the fresh regrowth of the first and begin the cycle of eating once again. The grass regrows naturally, eliminating the need for fertilizers, and the cows benefit from the nutrients available at the tips of each grass blade. 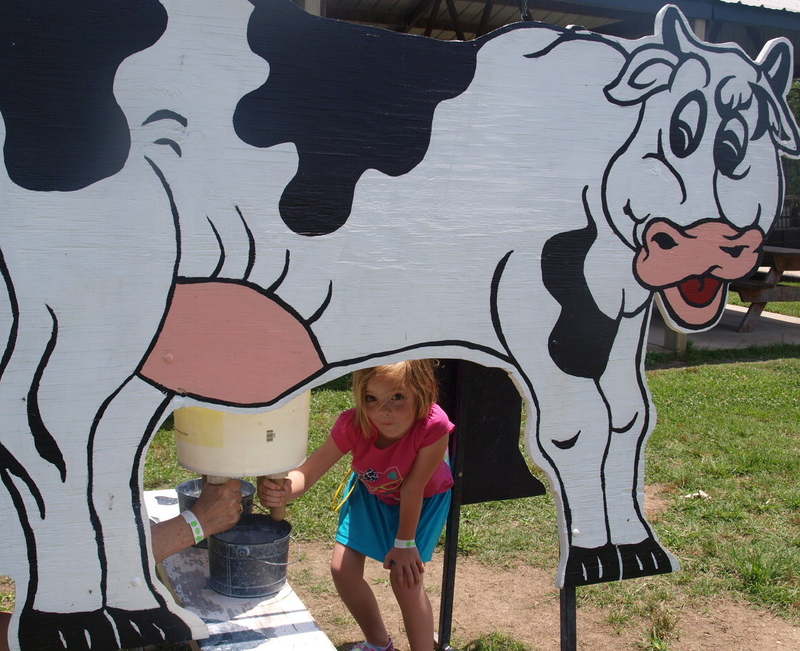 The girls are milked twice daily, producing the vitamin- and enzyme-rich milk – full of fat and nutrients – that has contributed to the farm’s continued success and consumer appreciation. Suzanne’s voice wavered as she recounted growing up by the farm and watching the cows move from paddock to paddock, expressing gratitude for having a local resource for healthy milk for herself and her family. Ashley, a trim, no-nonsense blond, explained the process and effects of homogenization with such clarity that I understood it completely. (Happy Cow does not homogenize their milk.) Their smiles and easy, confident demeanors broadcasted their pride and sense of purpose. As impressed as I was with the cows, it was quite something to witness how earnestly everyone we met at the farm wanted the business to succeed… and believed in what they did. At the end of the tour, our guides handed out unlimited samples of the creamery’s milk. The small children in our tour group scrambled for additional helpings of the chocolate and strawberry milk. Judging by the giddy grins of the adults who sat around me, I suspected some of the “big children” considered asking for seconds as well. Ashley handed me a paper cup of the creamery’s strawberry milk, winking and advising me that the small fatty chunks were the source of the milk’s “goodness.” The milk tasted like heaven in a cup. If you’re in the area, stop by and take a tour, and don’t forget to pick up a hunk of green olive cheddar cheese from the store. It pairs excellently with Granny Smith apples. Thank you so much for the awesome work you do! I had such a great time visiting and hope to visit again next time I’m in South Carolina.